According to WHO, the decibel level in the commercial areas at day should be highest 65 while at night that could be highest 55. Anima Rahman lives in a flat along a road in the capital’s Eskaton area. She along with his five-year daughter Tamanna and all members of her family have to suffer from acute sound pollution round-the-clock. Almost all of them are facing difficulties in hearing while in case of low voice they could not hear anything. Even their little child is also facing hearing problem. When they contacted with physician for this matter, the doctor suggested them to shift their flat into a calm place to get rid of this problem, otherwise, their little child will face much bigger problem in the coming days including certain possibility of having an impact on the brain due to severe sound pollution. According to experts, acute sound pollution hinders the usual mental growth of under-five children; it often raised their hypertension, decrease the usual sleeping time and negatively impacts their hearing power side by side they become inattentive in their academic activities later. The physicians said the children in the urban areas are being deprived of playing their usual games and sports which is also affecting severely their usual physical and mental growth. As a result, these children are being engaged in different anti-social activities and crimes in their later stage. They also noted that one of the main reasons for increasing the number of berths of physically and mentally challenged babies in the urban areas than the rural areas is sound pollution. 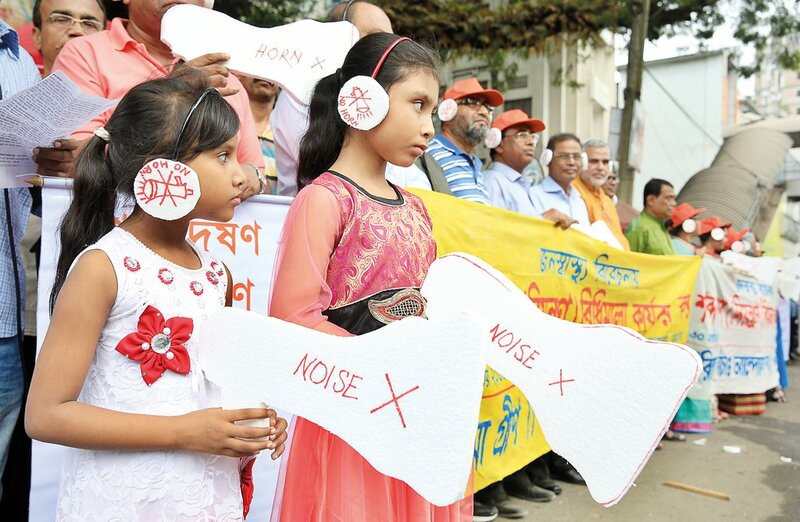 Sound pollution is putting serious impacts on the health of the children as they are suffering from multiple diseases like short of hearing, cardiac diseases, high blood pressure, chronic headache, obesity and other diseases. Besides, the poisonous lead in the air, carbon dioxide, carbon monoxide, sulfur in the air are causing respiratory problems, asthma, lung cancer, kidney damage, lever problem and various contagious diseases. After suffering from various complicated diseases, the resistance power of the children against various diseases is declining gradually day by day and the children are inching towards death. Director General of the World Health Organization (WHO) in a statement said that one of the main reasons for children’s death at present is environment pollution as polluted air weakens physically the children through affecting their body organs, immune system, and their respiratory system side by side decreasing their usual disease resistance capacity. According to surveys conducted by the WHO and UNICEF, some 12 types of environment pollution including sound pollution are the main reasons for some 30 types of diseases.Several surveys showed that the level of sound pollution in the capital ranges from 60 decibel to 106 decibels which is causing physical, mental and financial losses. In industrial areas, it should be limited to 75 decibel at daylight while at night, the decibel level should be restricted at 65.In case of silence zones like hospitals, the decibel level should be highest 50 in the day while in case of night, it could be 40. If the decibel level cross these limits, then it is considered sound pollution. Assistant Professor of the Bangabandhu Sheikh Mujib Medical University Dr AR Howlader suggested the vehicle workshop owners not to continue their operations here and there considering the health hazards of the children as the poisonous gas of different chemicals used in the workshop could cause various diseases like lung cancer. Renowned environmentalist and Poribesh Bachao Andolon Chairman Abu Naser Khan said in recent times, environmental pollution reached at an alarming level. He also underscored the need for checking sound pollution by any means. “If the government doesn’t take effective steps to stop environment pollution, then these sorts of pollution would take a dangerous shape in the near future and will put the entire world at risk,” he apprehended.